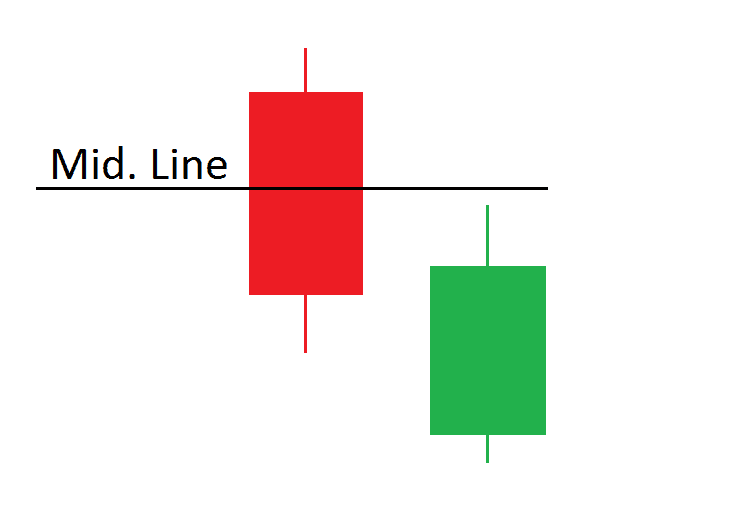 In this article, we will do a deep dive into 3 types of thrusting line candlestick patterns. We will then explore a few trading examples, so you can apply these techniques in Tradingsim. 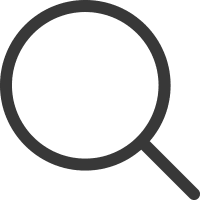 What is a Thrusting Line Candlestick Pattern? 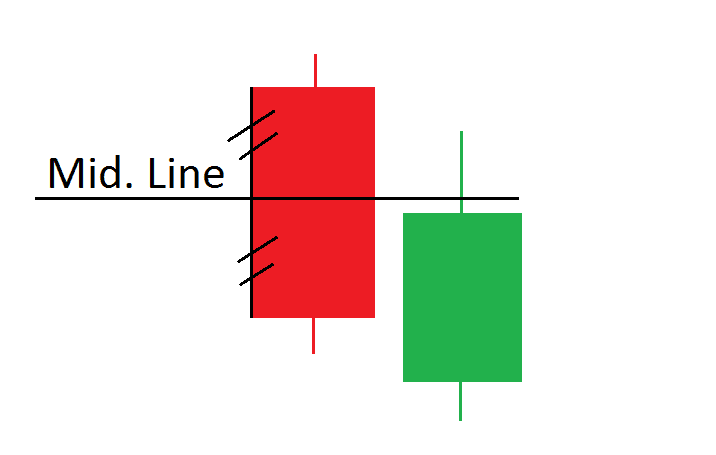 A valid thrusting line pattern starts with a bearish candle on the chart, followed by a “thrusting” bullish candlestick. This pattern leads to further downward pressure on the stock. So, as a trader in most cases you will look to get short once the pattern develops. It is crucial the opening price of the second candle gap down from the closing price of the previous candle. The other important requirement is the closing level of the second candle not cross the mid-point of the first candle’s body. 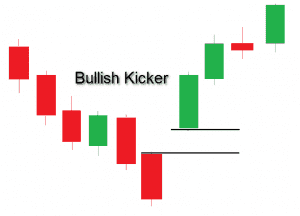 When these two requirements are met, you have a thrusting line candlestick pattern. 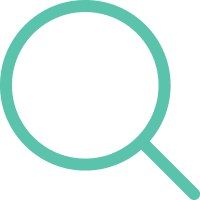 It is important to mention that the thrusting line candlestick pattern is not a reliable standalone signal, as two candlesticks is not enough to bet on future price moves. 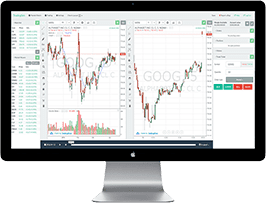 Therefore, you will need to combine the indicator with other trading techniques, in order to make consistent profits. The opening of the second candle is relatively lower than the close of the first candle. The closing of the second candle is barely touching the close of the first candle. The opening of the second candle is relatively distanced (downwards) from the close of the first candle. The closing of the second candle is relatively distanced from the mid-point of the first candle; however, both candles need to overlap. As you probably noticed, the second candle exhibits a stronger bullish move compared to the strong reversal thrusting pattern, hence less reliability of a potential continuation of the pattern. The opening of the second candle is almost on the same level with the close of the first candle. The closing of the second candle is almost on the same level with the middle point of the first candle. In this case, the second candle is even higher than in the previous example. However, the pattern still responds to the basic thrusting line requirements. The second candle gaps down from the close of the first candle. Also, the close of the second candle does not cross the middle point of the first candle’s body. Now that we have discussed the parameters and the structure of the thrusting line pattern, it is time to trade the setup. Prior to entry, you first need to confirm the pattern. This happens when a third candle is created and closes below the body of the second candle. This means that the third candle should be bearish. When this candle closes below the body of the second candle, we have received confirmation of the bearish thrusting pattern on the chart. At this point, you are free and clear to open a short position. The proper location for your bearish Thrusting Line continuation pattern is above the upper candle wick of the second candle. I know the stop loss section of the article is pretty short, but please take it seriously. Trading without a stop is a sure way to experience unnecessary pain. There isn’t a fixed target when trading the thrusting line continuation pattern. After all, a continuation pattern can run without stopping. Therefore, I recommend you use price action rules and the time and sales for deciding where to close your thrusting Line trade. Now it is time to discuss the opposite scenario related to the thrusting line pattern – the bullish thrusting line pattern. If you have the reversal version of the thrusting line, then you should be prepared to tackle the pattern with a long trade. However, you would first need to attain the confirmation of the pattern. Again, this happens with a third candle. This time, the third candle needs to be bullish and it needs to break the middle line of the first candle. If the third candle closes above this level, then you would need to go long. Again, it is necessary to secure your bullish thrusting line trade with a stop loss order. 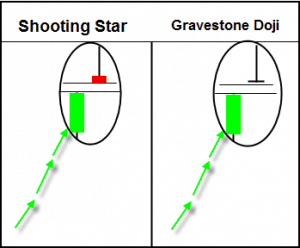 The stop loss approach of the bullish thrusting strategy is opposite to the one used for the bearish thrusting strategy. The right place for your stop loss would be below the lower candle wick of the second candle. The profit target rules for the bullish thrusting line strategy are same as for the bearish thrusting line. To find the right exit point of your bullish thrusting trade, again, I recommend you use price action rules and time and sales. We will now approach a trading strategy, where we combine the thrusting line with the trend line indicator. 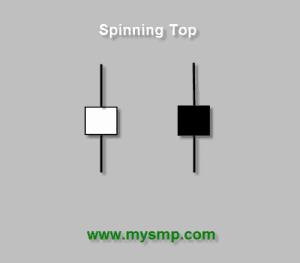 We will open the trades and place a stop loss order according to the thrusting line trading approach. In addition, we will seek assistance from a trend line in order to close our trades. Above is the daily chart of Twitter from Nov, 2015 – Feb, 2016. The image illustrates a standard bearish thrusting line trade. In the green circle, we see a strong continuation thrusting line and its confirmation candle. This makes three candles in the circle. The first two are bearish, followed by a bullish candle, which gaps down and closes almost at the close of the first candle in the pattern. The third candle is the confirmation, which breaks the lower level of the second candle’s body. Therefore, we have confirmation of a bearish thrusting line on the chart and we short TWTR. We also place a stop loss above the second candle in the thrusting line as shown on the image. Now our trade is protected against unexpected price moves in the opposite direction. The price enters a bearish trend afterwards. We have no reason to close the trade since we only see lower highs on the chart. Therefore, we draw a bearish trend line through the tops on the chart as shown on the image. We stay in the trade until the price action breaks the blue bearish trend in a bullish direction. This is shown in the red circle on the chart. We close our Twitter trade and collect profits. Above is the daily chart of Goldman Sachs from Jan – Feb, 2015. The image starts with a bearish price trend. As you see, we have marked the decreasing tops on the chart with a red bearish trend line. 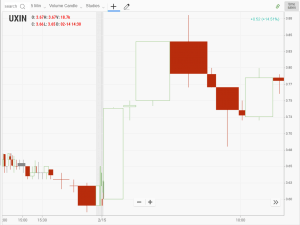 Suddenly, the price action creates a thrusting candle line on the chart, which is shown in the green circle. The pattern starts with a bearish candle and continues with a bullish candle, which creates a tiny bearish gap downwards and closes near the mid-point of the first candle. This is a classical bullish thrusting line on the chart. The next candle is bullish and it breaks the mid-point of the first candle from the pattern. At the same time, the next candle also breaks the red bearish trend line on the chart. This creates a strong long signal on the chart and we buy GS and place a stop loss below the second candle of the pattern. Next, we draw a bullish trend line (blue) at the bottom of the price action. We use this bullish trend to determine an eventual exit point of our long GS trade. We close the position when Goldman Sachs closes below the blue bullish trend. 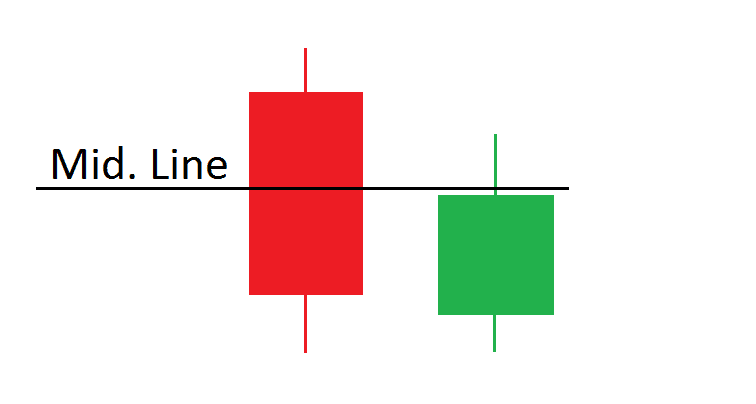 The thrusting line is a double candlestick pattern associated with bearish price trends. The first candle is bearish. The second candle gaps down and is bullish. The second candle closes below the mid-point of the first candle’s body. Identify a bearish thrusting line. Confirm the pattern with a third candle which breaks the lower body of the second candle. Place a stop loss above the second candle of the pattern. Use price action rules to determine your exit. Confirm the pattern with a third candle which breaks above the mid-point of the first candle. Place a stop loss order below the second candle of the pattern. 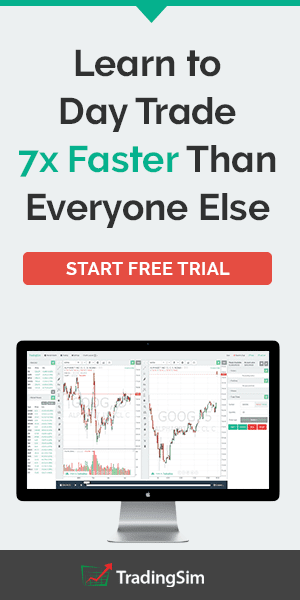 Use price action rules and time and sales to exit your position. The thrusting line pattern is not a good standalone indicator. Therefore, it is good to confirm its signal with an additional indicator. A good indicator to trade with the thrusting line is the trend line. 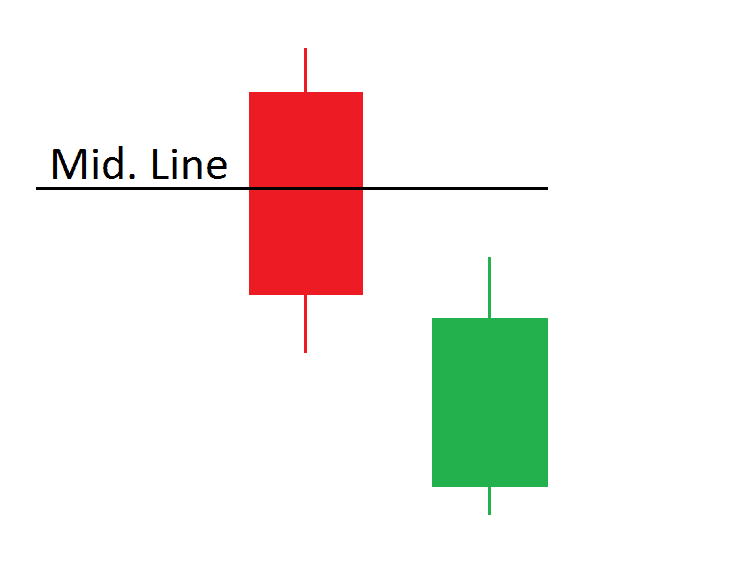 When you open a trade based on a thrusting line, attempt to measure the price action with a trend line. Stay in the trade until the price action breaks the trend line indicator in the opposite direction.